A "Piece" is a completed creative work. It could be a poem, a short story, an essay, a novel, a work of art, or a collection, etc. Your List of Pieces is an important part of your Control Panel. It ties into both your Submission Tracker and the Search feature. Keeping your List of Pieces up to date and organized can help speed up many aspects of the submission process. Note: We do not keep copies of your manuscripts. The List of Pieces is simply information about your pieces, not the pieces themselves. You can add a piece to your list either from the Your List of Pieces page or from the Submission Reporter. On the Your List of Pieces page, there's a link to "Add to your list" towards the top of the page. On the Submission Reporter, there's a link ("I need to add a piece to my list") in the "Piece(s) Sent" section. Regardless of the method you choose, the form is the same. Be sure to add each piece individually. If you will be submitting five poems in a batch, for example, add each poem on its own. Otherwise, it will be impossible for you to keep track of what piece you submitted where, or which piece got accepted. The only exception is if you are submitting a collection of pieces to be published as a stand-alone collection or chapbook. In that case, enter the title of the collection. Note: Once a piece is in your list, it can be associated with an unlimited number of submission reports. Enter the title of the piece (up to 50 characters in length). The form also has options for filling in the details of the piece in question, such as Length, Genre, Subject, etc. While this is optional, if you do fill it in, you will be able to quickly run searches for markets that accept that type of piece. For your own information, you can also enter the date you completed the piece, a brief note about the piece, and its submission status. Not surprisingly, you can access your full list of pieces from the Your List of Pieces page. There, you find a table of your active pieces. 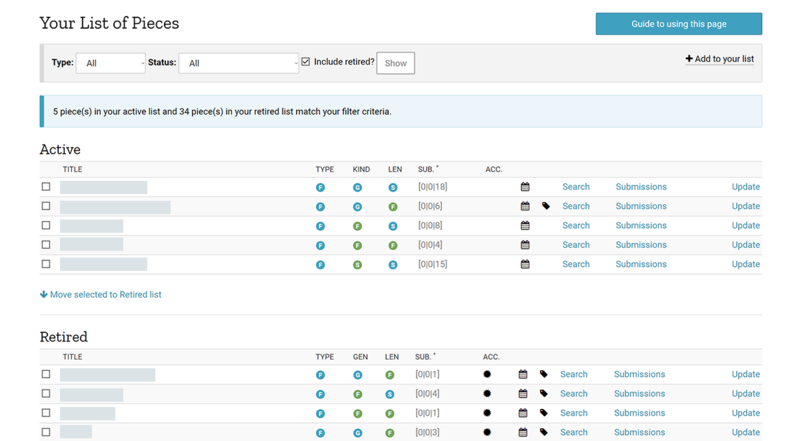 Also, if you have any pieces in your Retired list, you can choose to see those in a separate table. You can hover over any icon in the table(s) for a tooltip description. You can select the filter options at the top of the page to filter by type of piece (fiction, poetry, and nonfiction), status (currently submitted, not submitted, accepted, and not yet accepted), and whether you want to include retired pieces. At a minimum, each table displays the title of the piece, an icon indicating the type of piece, and links to show you Submission history for that piece and to Update information about the piece. 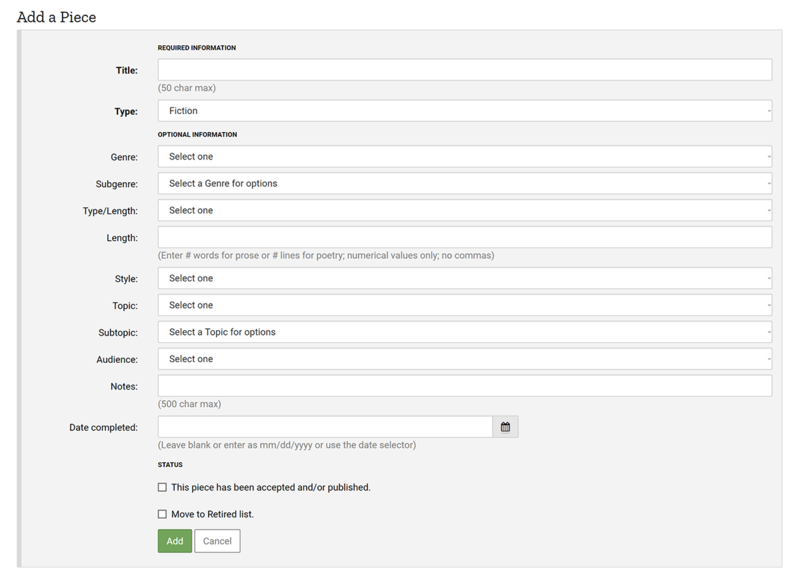 If you have entered Genre/Subject and/or Length details for the piece, there will be icons indicating that. If the piece has been submitted, you will also get data on the number of times the piece has been submitted, whether it's currently under review, (if so) whether it can be simultaneously submitted, and whether it has been accepted. If you have filled in details about the piece (such as Length, Genre, Subject, etc. ), the row for that piece will also display a "Search" link. If you click on that link, it will take you to our main search page with the search form pre-filled with details for that piece. You can then add any other search criteria you choose (such as Min. Payment, Simultaneous Submissions, etc.) and run the search. If you want to take advantage of this feature but you haven't entered those details for the piece, you can Update the piece. If you click the Update link for any row, you will be taken to a form where you can update that piece's details. The form is the same as the Add a Piece form, described above. If you want to move a piece from your active list to your Retired list (or vice versa), you can do that here. We hope this information has helped you understand how and why to organize your list of pieces. If you have any suggestions on how we can improve this guide, please let us know.